BioWash is NOT a fertilizer, yet field reports and testimonials from BioWash users reflect doubled and tripled yields following application of this fertilizer booster. One farmer in Iowa in 2009 sent photos of his BioWashed soy plants, showing them producing triple the normal number of nitrogen pods and double the amount of soy beans. While most crops were devastated by the 2011 drought in Texas, a BioWash user reported that his BioWashed oat fields out produced previous crops and raised protein levels in the oats to 26% (average is 12-16% protein). His neighbor’s oats were too sparse to harvest, so they opened their fields to cattle. 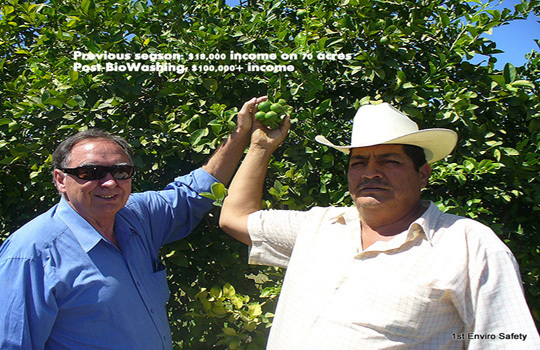 BioWash produces healthier crops, earlier market harvests and increased yields ….. all of which translate to increased market returns. It’s a slam dunk!